Pontifical Catholic University of Goiás’ mission, guided by its principles of academic excellence and social commitment, is to generate and share knowledge, to collaborate to the dissemination of a universal culture and to promote human formation. 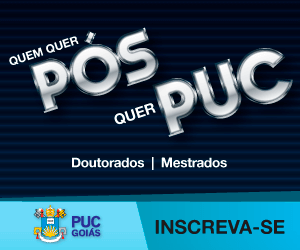 Based on its mission and vision, PUC Goiás offers graduate and specialization programs and supports permanent faculty members’ participation in graduate programs in the country and abroad. Graduate programs – master and doctorate – are offered aiming the formation of high qualified human resources to perform in teaching and also to the scientific and technological development in different levels of society. Join our programs. Continue to write you history at PUC Goiás.